I was going to wait until we reached 1,000 followers via Google but I couldn't- I'm so excited about this giveaway because a close friend is the owner of this online store. 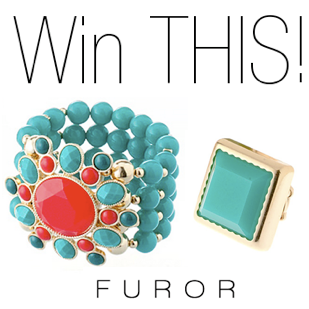 The requirement to enter this giveaway is to go to www.furormoda.com and tell me what your favorite items are- reason why I wanted to show you MY favorite items. - Turquoise square ring: $15. OBLIGATORY: go to www.furormoda.com and tell us what you loved- don't forget to fill out the form below. i don't know if my entry went through, is it supposed to show up here in the comments section? Thanks! Muchas gracias Dany!! Mucha suerte a todas.